Many bromeliads impound water in a central cup and/or in separate leaf axils. The small bodies of water thus trapped may function as aquaria for aquatic organisms and are called phytotelmata. The animals and other organisms that live in them are not pests of bromeliads, but a few (some mosquitoes) cause problems for people. Outer leaf axils of many bromeliads hold no water, but they do hold decomposing organic materials and are humid. Many species of terrestrial animals seek refuge in these bromeliad terraria, especially in the dry season in neotropical countries. These organisms are not harmful to the plants, but a few (venomous snakes and scorpions) may be harmful to people. Some organisms eat bromeliads. Some are specialists, and some are not. They range from fungi and nematodes through scale insects and weevils to squirrels (in North America) and spectacled bears (in South America). A few species of bromeliads trap and eat insects (and occasionally a few other unlucky animals). 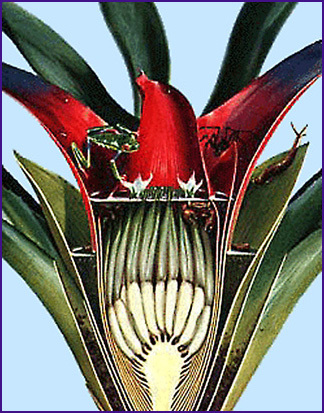 Pollination of bromeliads is by animals in all known instances. Seeds of some bromeliads are dispersed by wind, but animals disperse the seeds of others. We have received a Links2go Key Resource award in the Bromeliads topic! Click on the Links2Go logo to go to the bromeliads hot list. 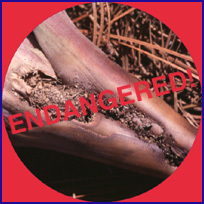 This site is maintained by Howard Frank, Entomology & Nematology Department, University of Florida (jhfrank@ufl.edu).